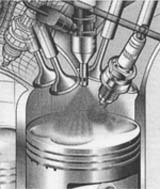 Spray-guided petrol direct injection engines require particular precision when replacing spark plugs. The latest generation of petrol direct injection systems (spray-guided petrol direct injection) makes entirely new demands on spark plugs. The basis for satisfying these demands is virtually tolerance-free production, linked with redevelopments in terms of materials, geometry and manufacturing methods. 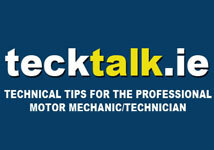 Spray-guided petrol direct injection also calls for accurate positioning of the ignition spark. 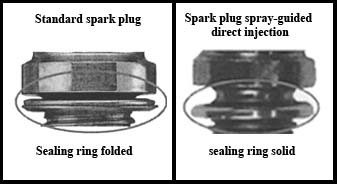 Great care must be taken when fitting the spark plugs with a solid sealing ring developed for this purpose. The position of the ground electrode with respect to the injector is precisely defined and there is a prohibited installation position. Accurate replacement work is essential to avoid subsequent damage. Engine and catalytic converter damage.